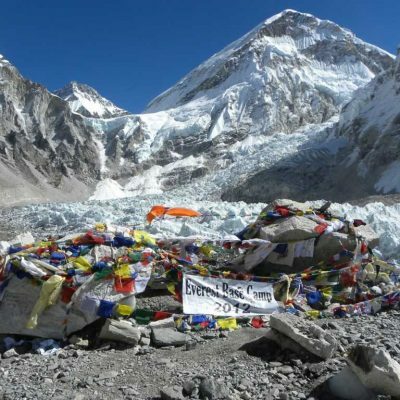 Many Trekkers call it as best point to witness Everest. Even Sir Edmund Hillary claimed it as his favorite spot to enjoy Everest. The name Pikey is derived from local Sherpa Clan deity which represents the sky over the nature. 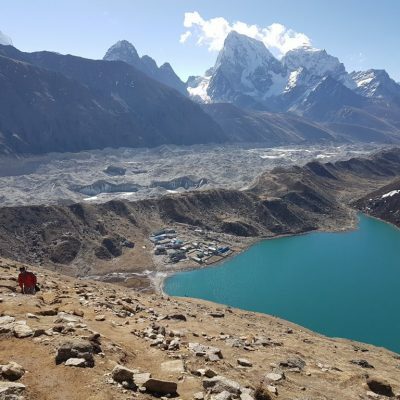 Pikey Peak Trek is newly introduced trekking route in Khumbu region which allows us to enjoy up-close view of Everest and lower Khumbu region along with magical landscapes. The view of sunrise and sunset over the giant peaks is so magical that it will become your lifetime memory. Apart from majestic Himalayan views, you will get opportunity to discover unique geography and the life it supports. The unique Sherpa Culture and their hospitality is very intriguing. 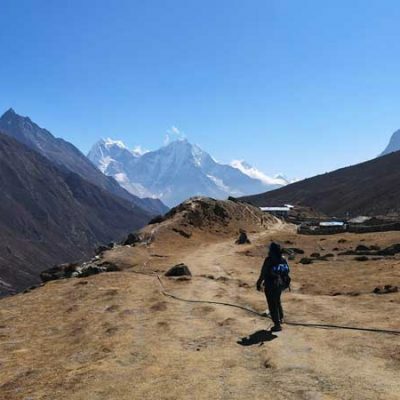 Being a newly discovered trekking route, it offers an off-beat and solitary trekking experience. 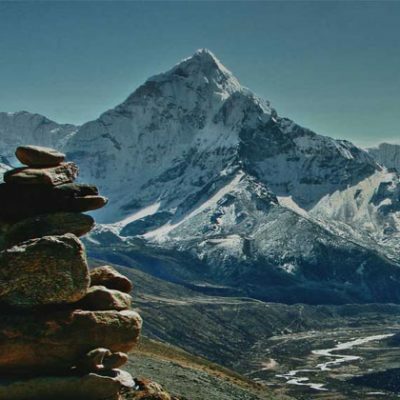 7 days Pikey Peak Trek Itinerary is designed to minimize the risk of AMS by limiting the daily gain in altitude. The Pikey Peak trail route is covered with lush forests of rhododendron, oak and pine. You will walk through numerous villages perched on ridge tops surrounded by terraced fields. From Pikey peak, you will get the grand view of mountain peaks – Dhaulagiri, Everest, Makalu and Kanchenjunga to the far west. 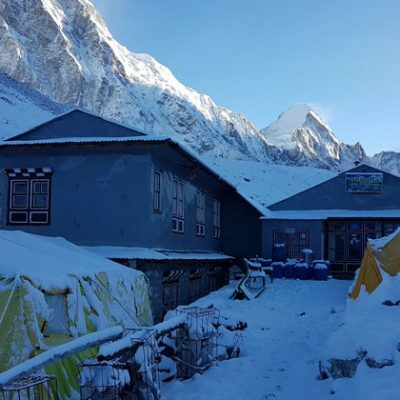 The teahouse accommodation along the trekking route is simple and offers very basic facilities. 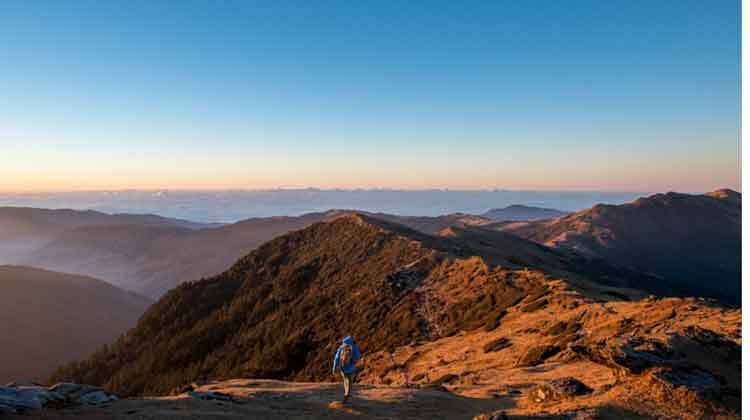 Pikey Peak Trek is suitable for anyone willing to witness the Himalayan peaks and authentic local lifestyle within few days. For those willing to undertake a Pikey Peak Trekking, even for a one-shot adventure, it’s not enough to just show up with your gear and guidebook. You must be physically and mentally prepared to achieve the height and the distance, as there are not any quick exits from the side of a mountain. So if you are planning to take on a peak, we suggest you to spend an appropriate amount of time and energy to prepare yourself to face the challenge that mountains puts on you. Jogging, Running, Swimming and Leg exercise few weeks prior the trek would be an appropriate physical training to prepare yourself for the trek. Also make a Pikey Peak Trek Map handy and consider reading Pikey Peak blog before starting the journey. September – December during autumn and February – June during spring are the best time of the year for Pikey Peak Trek. These seasons are known for wonderful weather and excellent views. Autumn brings happiness in Nepal as the major festival of Nepal falls in this season. Likewise, the spring is the time of joy with different flowers blooming around the entire country. Monsoon brings heavy rainfall in Nepal; inviting the threat of landslide and flood. Moreover, the trail will be slippery and leeches will encroach you throughout the forest trail. But this season might be perfect for keen botanist as the entire trekking trail will be filled with lush vegetation. 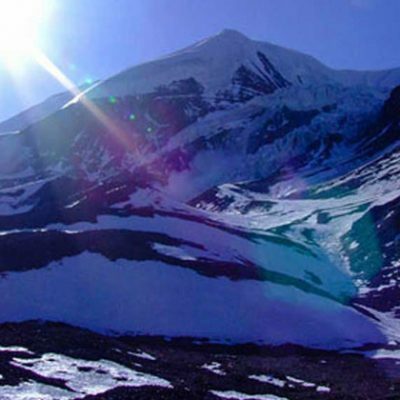 The extremely cold temperature in winter might not be perfect for every trekkers. If you are willing to trek Pikey Peak in winter, we suggest you to check the availability of teahouse at higher altitude. The teahouse often remains closed; as people migrate to lower elevation to escape cold and snow. After arriving at Tribhuvan International Airport, you will be welcomed by the representative of Adventure Great Himalaya and you will be shifted to your hotel. The employees in the hotel will manage your accommodation and check in. In the evening, a welcome dinner will be organized in the hotel. Day 02: Kathmandu Valley Sightseeing and Preparation for Trekking. Kathmandu, the city of temple, houses numbers of ancient heritage sites. After morning breakfast, you will proceed to visit the highly venerated heritage sites of the city that includes – Pashupatinath, Boudhanath Stupa, Swayambhunath Temple and the Kathmandu Durbar Square. All these ancient sites are highly revered by both Hindus and Buddhists. The Durbar Square of Kathmandu houses many ancient palaces, temples and statues which are from medieval periods. The buildings are embellished with unique Nepali architecture and contains amazing wood works. Likewise, Pashupathinath is the sacred Lord Shiva temple in the world. Here you will witness the traditional cremation ceremony of the Hindus along the Bagmati River Bank. In the same way, Boudhanath holds the great religious significance for Tibetan Buddhist. And Swayambhunath – located at the top of a hill, is sacred temple for both Hindus and Buddhist. This heritage site offers close peek to Nepalese culture and its history. After the tour, you will drive back to the hotel and make necessary preparation for the next day trip. After breakfast, we will leave Kathmandu and drive to Dhap Bazaar. The driving route follows the Sunkoshi River until Ghurmi. On the way, we will get opportunity to witness the typical Nepalese countryside lifestyle, rivers, forest and terraced fields. Driving through numerous settlements, we will finally reach Dhap Bazaar. Here we will explore the local market and observe the lifestyle of local people. Today we start our trek along a dry trail that leads us to Sigane. Then the trail further moves along the bumpy roads to Jhapre. At Jhapre, you will find many vantage points that displays grand views of mountain peaks. We will get the clear view of Mt. 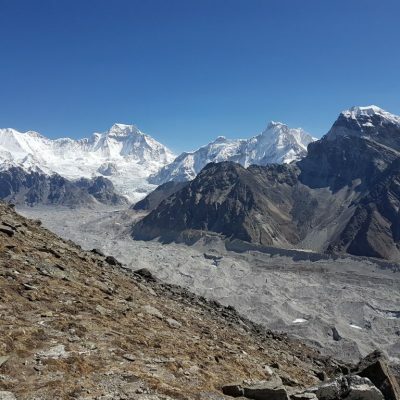 Everest (8,848m) and the Numbur Himal. Also we will visit Gompas and Stupas in the villages. Today we start early with the rays of sun. Initially we follow a dusty trail which later leads on an uphill trail to Bhulbule. From here the trail becomes steeper and climbs through the rhododendron forests and small settlement of Lhamuje. From Lhamuje, the trail become wider and follows a pasture where we can see grazing Yaks. Further we will walk through a long Mani Wall and ascend along the winding road to Pikey base camp. Here you can visit Yak Cheese factory and relish the magical view of mountains around. Today we make a pre-dawn hike along the steep rocky ridgeline to the Pikey Peak (4,065m). Here we will get the mesmerizing view of sunrise over the Mt. Everest (8,848m), Numer Chuli (6,959m), Dhaulagiri (8,167m), Gaurishankar (7,134m), Dorje Lakpa (6,966m) and Langtang. After some magical moments, we will descend down along Mani Walls and Chortens to reach Junbensi. At Junbenis, we will visit an old monastery and capture the best view of Numbur Himal in the north. Today is the last day of the trek. We will continue through a dusty trail along the Junbensi Khola and cross steel suspension bridge to reach Beni Ghat. 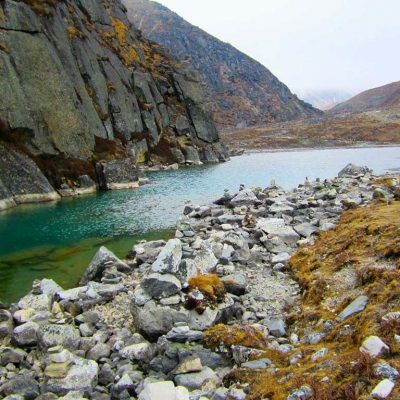 Further walking through the forest and cultivated fields, we will reach Phaplu. Here we will bid farewell to the majestic Rolwaling region. After breakfast, Drive Back to Kathmandu by Jeep. In the evening, join a farewell dinner hosted by Adventure Great Himalaya to celebrate the successful completion of the trek. Your adventure holiday in Nepal comes to an end today. An airport representative from Adventure. Great Himalaya will transfer you to the Tribhuvan International Airport for your final departure. All ground transportation from Kathmandu to Ghap by Private 4*4 Jeep.